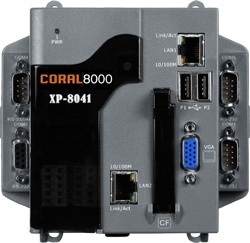 The CORAL-8041-16 solution consists of the CORAL unit without a backplane for plug-in I/O Cards and a SCADA Package which will handle up to 16 I/O tags. The software also includes 2 independent logfiles, 64 User Defined Analog Channels (for setpoints etc), 64 User Defined Digitals Channels (for virtual switches etc) and 64 Derived Calculator Channels for data manipulation. A single driver is included while various additional drivers are available as options. The 0 Slot unit is ideal for applications that need no local I/O connections. It is to be used with other devices or if the data acquisition is needed closer to sensors that are spaced a distance apart. In this scenario you would use a distributed I/O system such as the I-7000 range. This could include use of ZigBee Converters or I/O units to provide a wireless network. Optionally the data can be stored to a CF Card or USB Flash stick.? Configure locally or via Remote Desktop (1 User, Windows XP or greater)? Orchestrator OPC Server allows other software packages, which include OPC Clients to access channel data from Orchestrator.